2 x 4 Speed cut – This will be a timed event. The top 3 finishers may be awarded prizes. Points may be awarded for event totals and yearly totals. Multi Station Course – The course will be designed on a per event basis. This will be a timed event. The top 3 finishers may be awarded prizes. Points may be awarded for event totals and yearly totals. 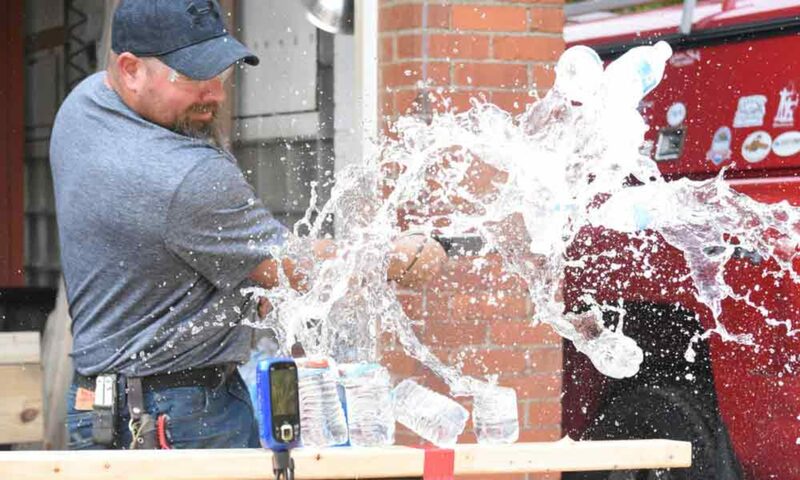 Single Station Multi-cut – This event will have a single table where different cuts will be set-up — 2 x 4, rope cut and other cuts as determined by event officials. Prizes may be awarded to the top 3 Cutters. Points will be awarded for event totals and yearly totals. There will be different types of planned events at BladeSports competitions. A competition may include any or all event types. Space requirements will be provided by Event Sponsors for each type of event. New events may be added to BladeSports competitions. Space requirements will be determined as new events are planned. A competition site must be provided by a sponsor that offers adequate space for the planned events. Barriers will be placed for crowd control and event assistants will be located at strategic locations to halt an event should spectators cross the control boundaries. Event Officials will inspect all knives prior to the start of each competition for adherence to BladeSports knife specifications. A competitor may challenge a call from an official. Event officials will evaluate the challenge and make a ruling. Competitors must abide by the ruling. One official will start each cut. Any official may stop any cut. A time/point penalty will follow any minor deviation from procedure or cut instructions. Penalties will be administered for any safety, rules or procedure infraction. These will range from a warning up to and including loss of Cutter Certification. A competitor may refuse a cut if there is a question of safety or fairness. Event officials will make a determination and will implement any necessary changes to set-up and/or materials.